Find out what we've been up to! COQUITLAM, BC – Watching salmon fight their way upstream to spawn each fall is an awe-inspiring experience – even after a quarter century. This year’s Salmon Come Home event at Hoy Creek Hatchery Oct. 22 celebrates 25 years of welcoming the salmon back to their spawning grounds, and educating the public about the lifecycle of salmon and the watershed that supports it. Co-hosted by the City of Coquitlam and Hoy-Scott Watershed Society, the free family event runs from 11 a.m. to 3 p.m. and includes hatchery tours, music, crafts, environmental displays, food, and children’s activities such as a costume parade and storytelling. The highlight is witnessing the return of chum and coho salmon to the creek where they were spawned, after living most of their adult lives at sea. Prime viewing of the returning salmon is from mid-October to early November. When the festival started in 1992, today’s Hoy-Scott Watershed Society was known as the Hoy-Scott Watershed Streamkeepers and the hatchery did not yet exist. The event was in its fifth year when the hatchery was built in 1997 on the grounds of a former trout-rearing facility on the old Frederick Brewer property. The site was restored in 1995 with help from the City, federal government and volunteers, and the pond that used to rear trout now helps raise salmon. The Hoy-Scott Watershed Streamkeepers formed a society in 1992, with an expanded mandate to promote watershed restoration and public awareness of the need to preserve the creek and surrounding habitat. Having met the original goal of rebuilding the coho population, the society extended its focus in 2015 to include chum salmon. While Salmon Come Home has evolved and grown over the years – now typically attracting thousands each year – at its heart it has always been a celebration of one of nature’s wonders: the salmon’s annual return to its spawning grounds. Those attending on Oct. 22 are advised to dress for the weather. The event runs rain or shine. The Hoy Creek Hatchery is in Hoy Creek Linear Park, west of the City Centre Aquatic Complex (Pinetree and Guildford Way), and is a seven-minute walk from the Lafarge Lake-Douglas SkyTrain Station. Visitors can walk in from a variety of locations: from Princess Crescent, from behind Douglas College; from Guildford Way (between Johnson and Pinetree), from Walton Avenue or behind Walton Elementary, or from the foot of Lasalle Place. Free parking is available at Coquitlam City Hall, Pinetree Community Centre and Douglas College. For the Google location map, click HERE. RSVP to the Facebook Event Page. On June 15, 2017 we performed our fourth fin clipping exercise at Hoy Creek Hatchery for our coho salmon fry. The adipose fin is removed after the fish are sedated. It's a fast process and many careful hands make light work. The entire procedure is overseen by the Department of Fisheries and Oceans. All fry recovered expect one of approximately 5500 fishmarked. The markings help the society identify hatchery fish during returns in the fall. Thanks to Hoy-Scott Watershed members who provided the photos seen here. EGGS HARVESTED* by mid-December: Est # of 65,889 (Coho: 30298, Chum: 35,591) - this is our first year raising both chum and coho since the mid 1990s. We take this time to welcome our 2016 new HSWS members: AJ, Sarah, Tiffany, Lily, Jamie, Tyson, Carlos, Etienne, Ivo, Isabella, Daniel, Maurice, Tyson, Simone, Shannon, Patrick and Ashley, and thank all of our existing members and supporters such as the Department of Fisheries and Oceans Canada, the City of Coquitlam, Kwikwetlem First Nation, Pacific Streamkeepers Federation, Pacific Salmon Foundation, 98.7 The Point radio, Coquitlam Foundation, and Vancity. You can read all our 2016 happenings and news HERE. We hope to see you at our Salmon Leave Home event on May 7th, 2017! Thank you for your support, Tri-City News! The Hoy-Scott Watershed Society was quoted in the The Tri-City News on November 16th, 2016, along with other stewardship groups, on how we can all do our part in protecting wild salmon. We were also featured on November 19th through a site visit by reporter Sarah Payne. Both HSWS president, Robbin Whachell, and vice president and hatchery manager, Rodney Lee were interviewed for the article. Department of Fisheries reps led by Scott Ducharme (right) lead HSWS members through a chum egg take on October 26th at Hoy Creek Hatchery. Hoy-Scott Watershed Society began incubating chum eggs in October and November. The Society had only been raising coho salmon for the past twenty-years or so. The addition of chum was made possible through the generous support of the Pacific Salmon Foundation enabling us to purchase and install a new incubation stack and piping for our Capilano trough room. Thanks also to the DFO and City of Coquitlam. The hatchery has not raised chum since the mid 1990s and applied to do so again in 2015. "Most of the chum eggs are now eyed and doing great. We had a poor survival rate in 2 of the trays, but the remainder looked good," said hatchery manager Rodney Lee. Coho egg-takes are our next focus and are now underway. The new chum egg incubation stack is now incubating over 36,000 eggs. Thanks to the Pacific Salmon Foundation, DFO and the City of Coquitlam for contributions to complete the project. In the videos below, eggs from 4 chum salmon are fertilized by hand at Hoy Creek Hatchery in Coquitlam. Guided by Scott Ducharme of the DFO. See MORE PHOTOS on our Facebook page. On Saturday, June 25th volunteers with the Hoy-Scott Watershed Society, under the guidance of hatchery manager, Rodney Lee, moved the coho salmon brood from the Capilano trough room over to the outdoor rearing pond adjacent to Hoy Creek. After the transfer of over 6000 fry, members cleaned all equipment in the trough room, which will not be used again until brood intake in the fall. The Capilano trough will remain empty until early next year. Both incubation areas were also cleaned and disinfected so they are ready for brood intake this fall / winter. 2016 will mark the first year of the intake of chum salmon, along with coho. We invite the community to come by and take a peek through the fencing on our rearing pond to see the salmon, which are usually visible on clear weather days. The fish are fed daily before 10am. Feel free to stop by and ask questions of our volunteers. See our Photo Album from this exercise on Facebook HERE. The fish are now living in the rearing pond adjacent to Hoy Creek. They are seen below in this video. See more photos of our rearing pond HERE. Volunteers clean charcoal by hand in a wheel barrow. The charcoal is used for the filtration system for the Capilano trough. On a beautiful spring day, May 1st, the Hoy-Scott Watershed Society (HSWS) held our annual Salmon Leave Home event at the Hoy Creek Hatchery in Coquitlam with record attendance. Our lineups to collect fish in our rearing pond went past the hatchery building at peek times of the day, and we had to open up a second release point on the creek to keep things flowing. Honourary guests were Kwikwetlem First Nation councillor Ed Hall, and elder Beverley Mrockowski who both spoke at a brief opening ceremony, and then released the first coho smolts into Hoy Creek. "Kwikwetlem means 'red fish up the river'," said Ed Hall who spoke of his elders sharing stories of when the local creeks and rivers were teaming with salmon. "It's a rare opportunity to see fish leave their local habitat and return." It was an extra-special day as HSWS honoured one of our own, as Len Meneghello, who recently retired was celebrated after giving 12 years of service to the Society. Kwikwetlem councillor, Ed Hall releases some of the first salmon on May 1st at Hoy Creek during Salmon Leave Home. The Society was pleased to welcome a group of Coquitlam's newest Syrian immigrant children attending with Coquitlam mayor Richard Stewart, and councillor Teri Towner. They participated in the salmon release and learned how to build bird boxes and bee houses. The society wishes to thank the community for their interest and support. Special thanks goes out to Kwikwetlem First Nation, CKPM 98.7 Tri-City Radio; Pinetree Secondary School, Sustainable Youth Canada, Coquitlam Farmer's Market Society, and Rocky Point Ice Cream. ALL of our photos from the event can be viewed on our Facebook page. Hoy-Scott Watershed Society, is a not-for-profit, volunteer run environmental stewardship group, that conducts a year-round salmon enhancement program in partnership with the City of Coquitlam, and the Department of Fisheries and Oceans Canada. They are actively involved in watershed restoration, public awareness, education and preservation. If you would like to become a volunteer, please let us know HERE. Listen to councillor Ed Hall speak at the opening ceremony. A great time was had by all! Thanks to all our amazing volunteers! Join the Hoy-Scott Watershed Society on Sunday, May 1stfrom 11am to 2pm at Hoy Creek Hatchery in Coquiatlam as thousands of coho smolts will be released into Hoy Creek to make their way down to the Pacific Ocean. 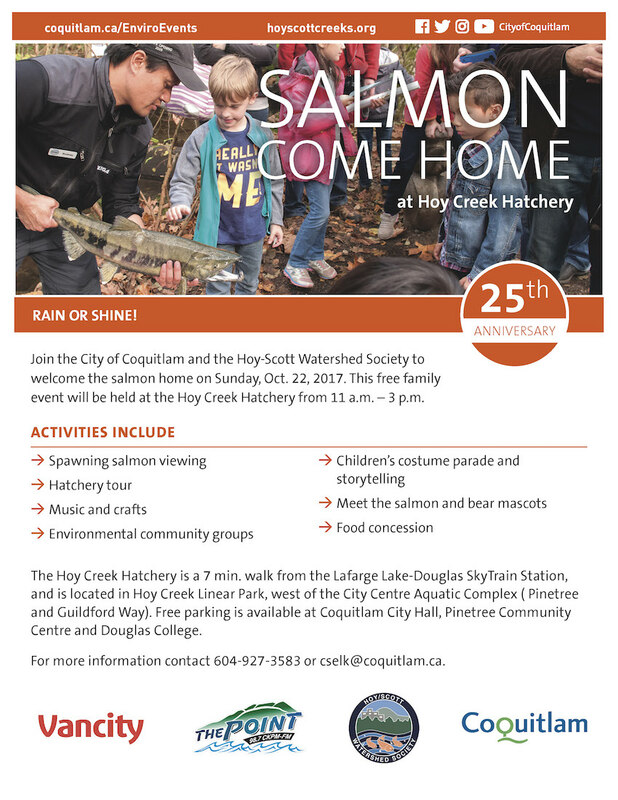 The Hoy-Scott Watershed Society invites the community out for their annual Salmon Leave Home event on Sunday May 1st from 11am to 2pm at the Hoy Creek Hatchery in Coquitlam. Children of all ages will have the opportunity to help release 18-month-old coho smolts into Hoy Creek. “Salmon Leave Home is a great event for families to discover firsthand the wonders of nature in their environment,” said hatchery manager, Rodney Lee. “Once the salmon are released they make their way downstream to Scott Creek, then Coquitlam River, then the Fraser River which empties into the Strait of Georgia on the Pacific Ocean. They return in about 2 years time to the location where they were spawned,” said Lee. The family-friendly free outdoor event will run rain or shine and the society will have families engaged in building Mason bee boxes, and bird houses. Music is being provided by CKPM FM Tri-City Radio, and guest artist, Etienne Sew. Society volunteers will be providing tours and information on the salmon enhancement program which is a year-round operation and includes work with plants in the riparian area of Hoy and Scott Creeks. 20,000 coho fry will also be on display and this year’s event includes activities and/or participation by Pinetree Secondary School, Sustainable Youth Canada, Coquitlam Farmer's Market Society, Rocky Point Ice Cream, and Kwikwetlem First Nation. More information can be found at the society’s website, hoyscottcreeks.org or at hashtag #SalmonLeaveHome. Hoy-Scott Watershed Society, (HSWS) is a not-for-profit, volunteer run environmental stewardship group, that conducts a year-round salmon enhancement program in partnership with the City of Coquitlam, and the Department of Fisheries and Oceans Canada. We are actively involved in watershed restoration, public awareness, education and preservation. Hoy Creek hatchery manager, Rodney Lee noticed something peculiar while examining our 2015 -16 brood of coho salmon in the alevin stage in our incubation room at the hatchery recently - a two-headed, but one-body salmon living off of one yoke sac. "This is an example of a Siamese fish, or conjoined twin," said Rodney. "It happens in nature occasionally." When we posted a video of the fish on our Facebook page, some followers expressed concern that they might be in pain. We've done some research online and we found one story about conjoined 8 month old Nile Tilapia fish. "It is unlikely that they will survive once they need real food to live," said Rodney.